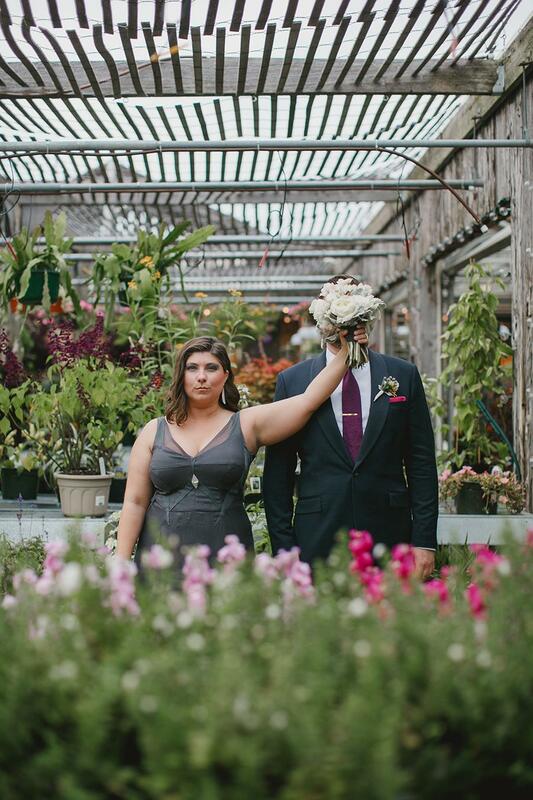 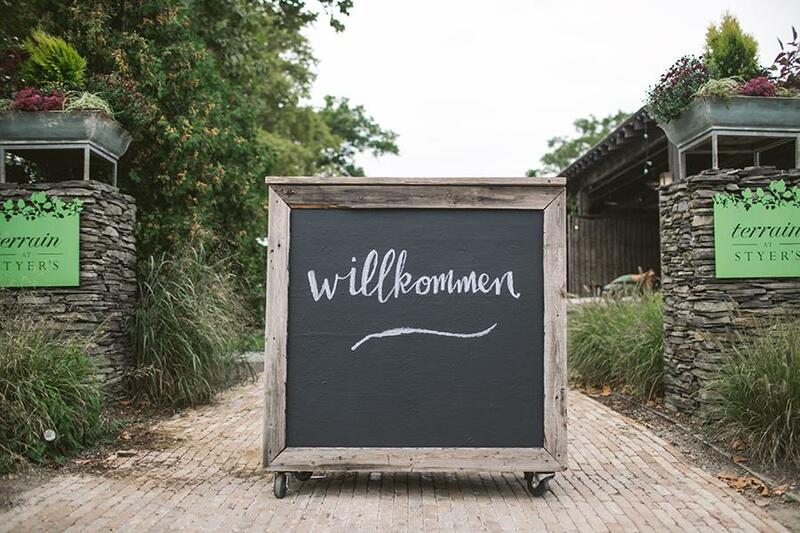 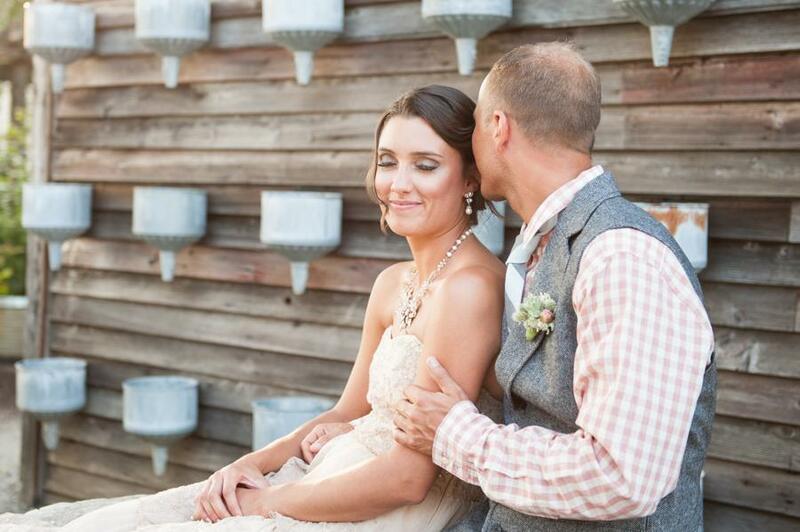 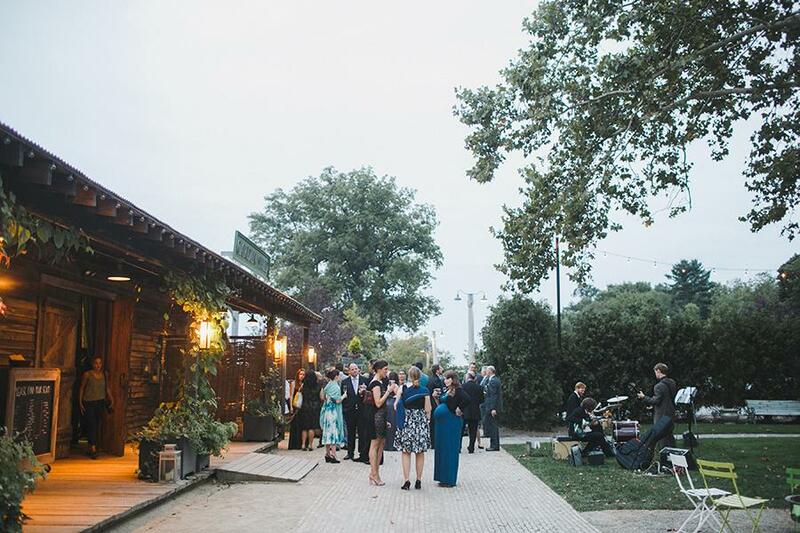 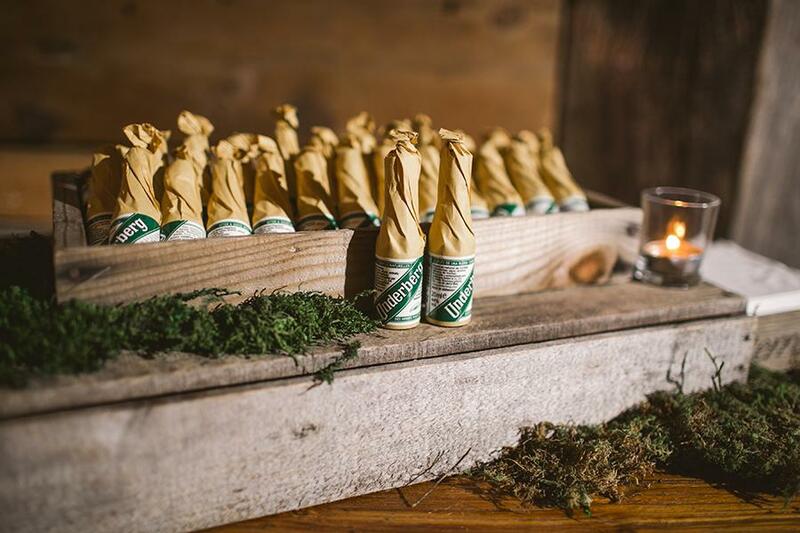 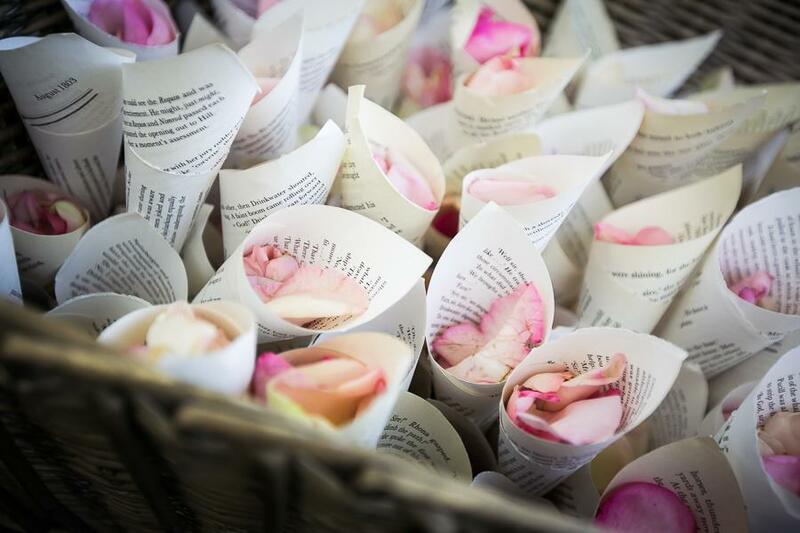 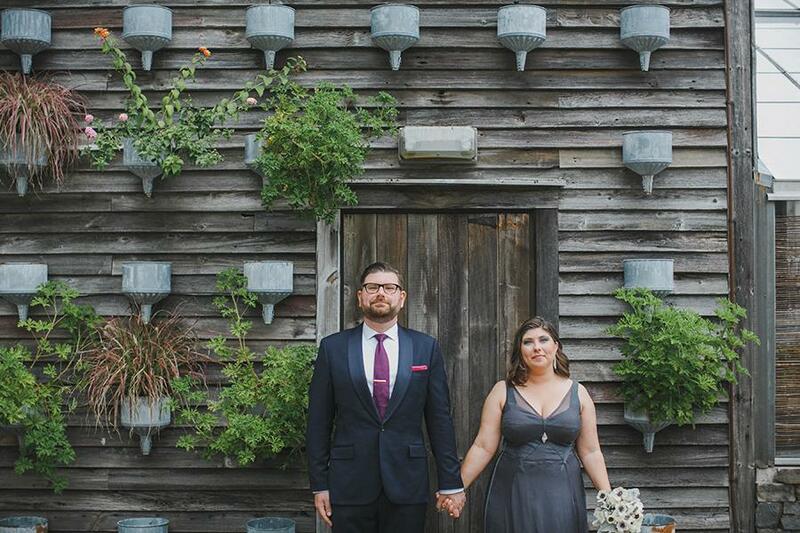 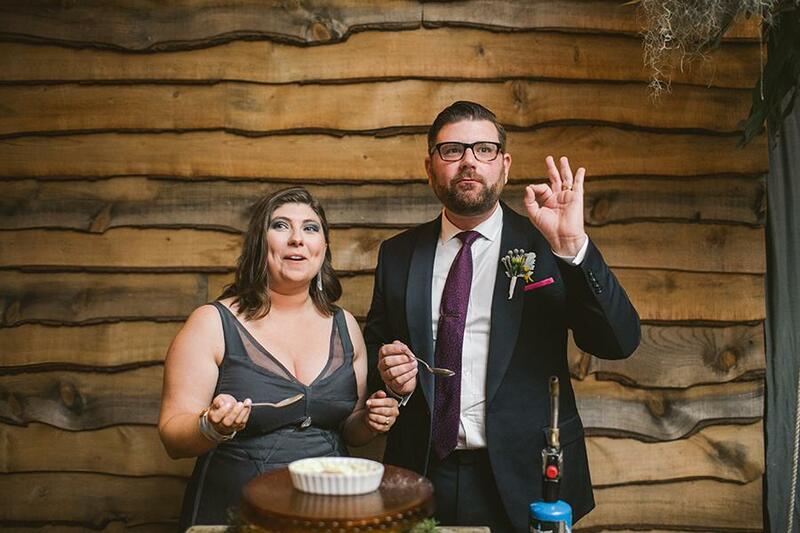 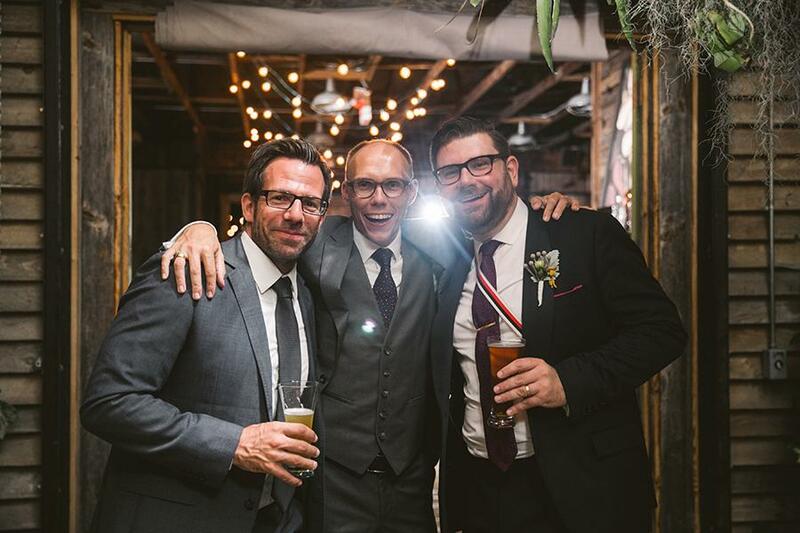 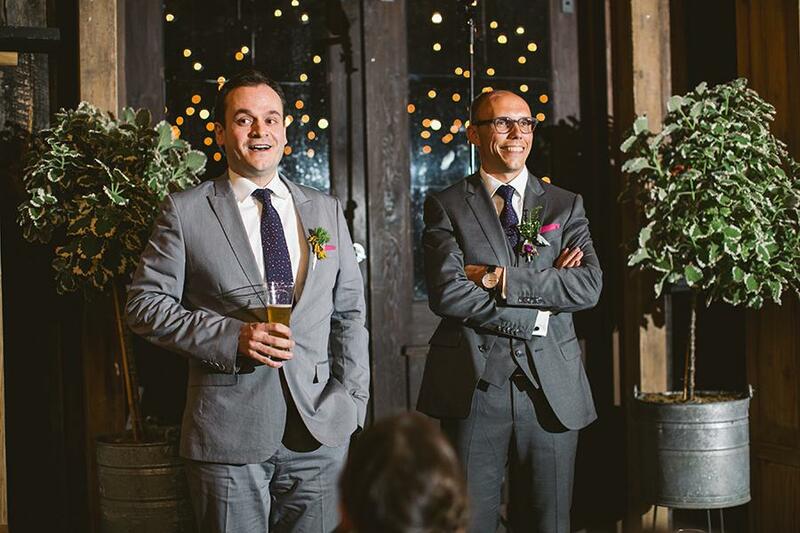 This couple’s wedding is eclectic with a touch of nature, and elements of German culture. 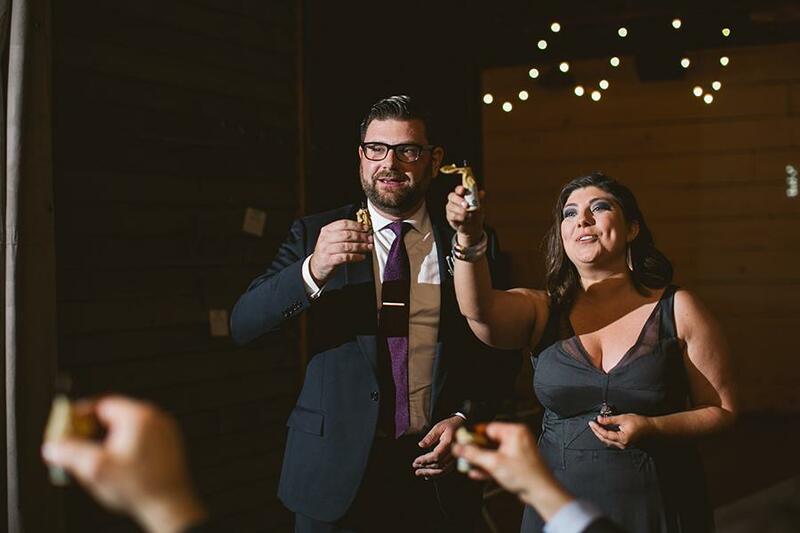 Sarah and Rene met one surreal day in Germany, which is Rene’s native home, so there’s no surprise that this couple toasted with mini Underberg (a delicious German digestif) bottles in hand. 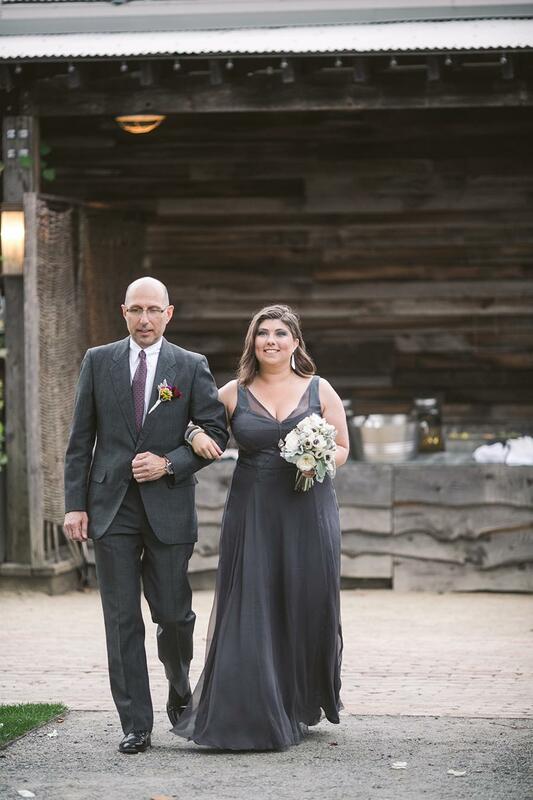 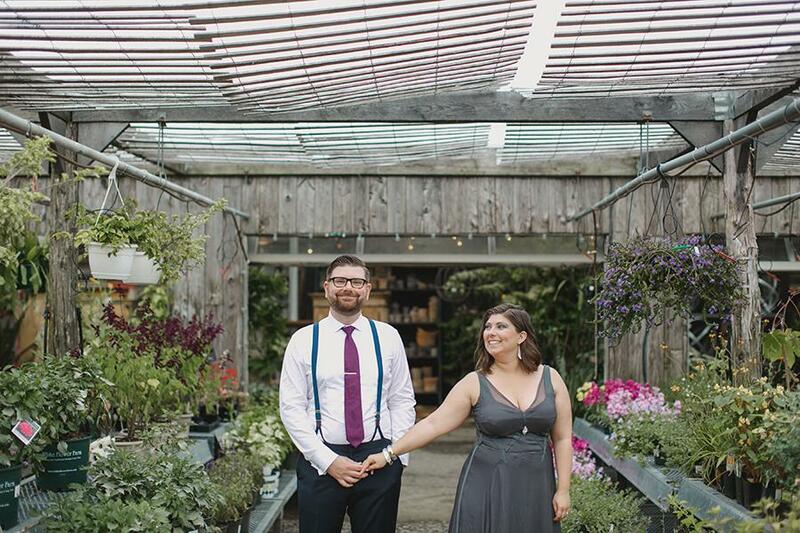 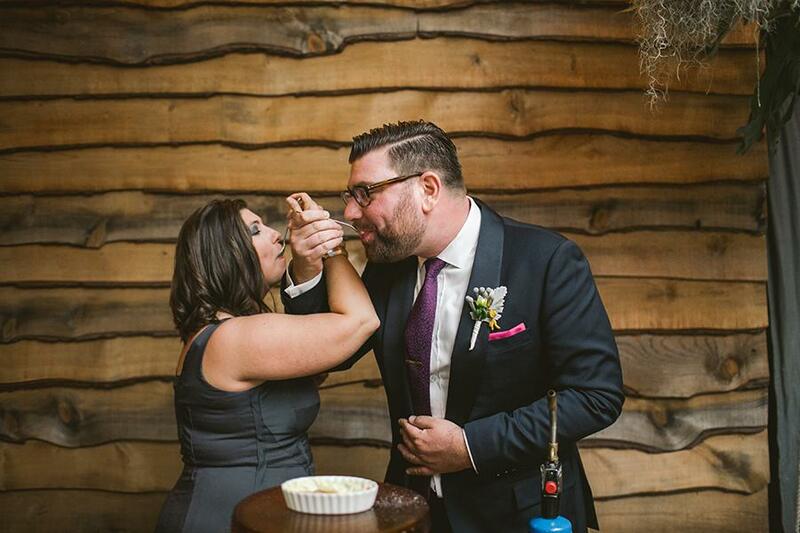 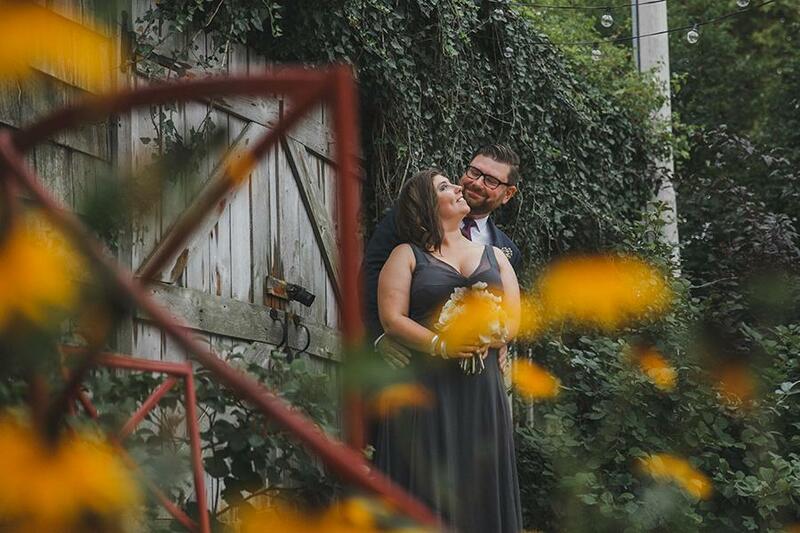 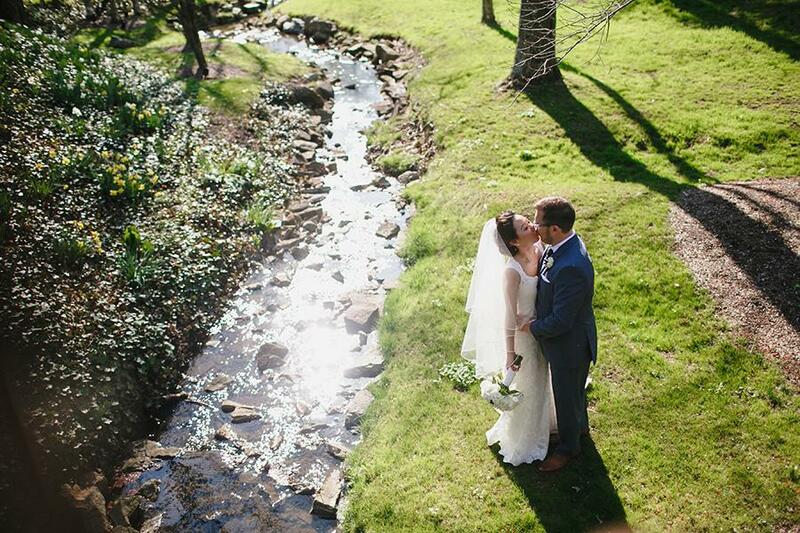 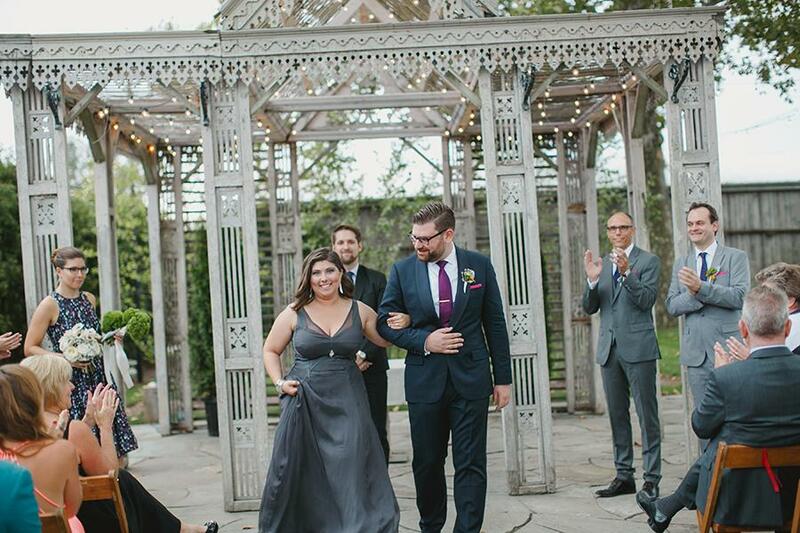 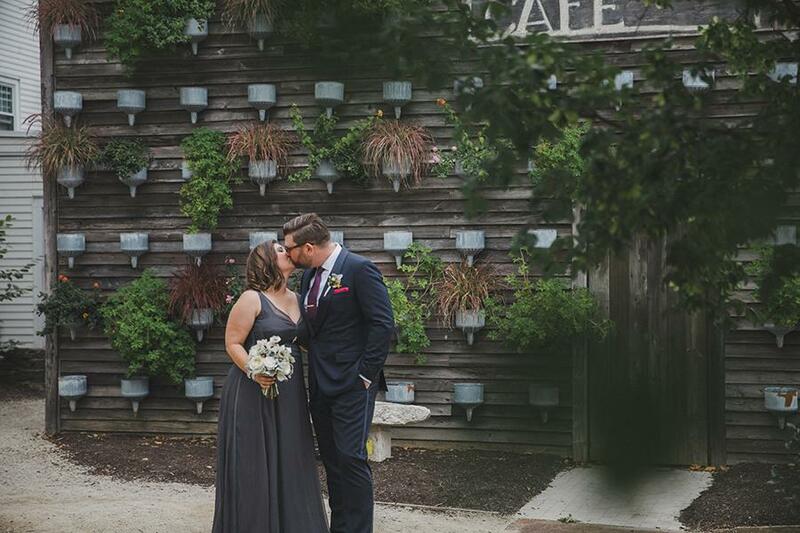 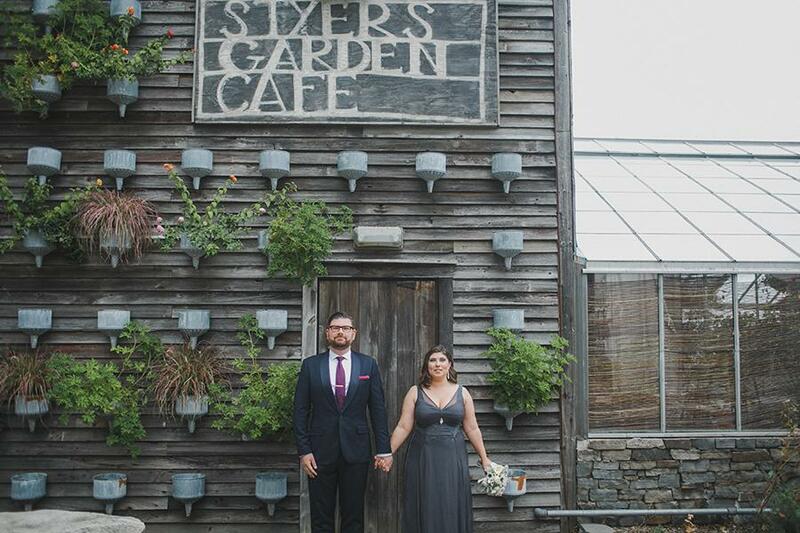 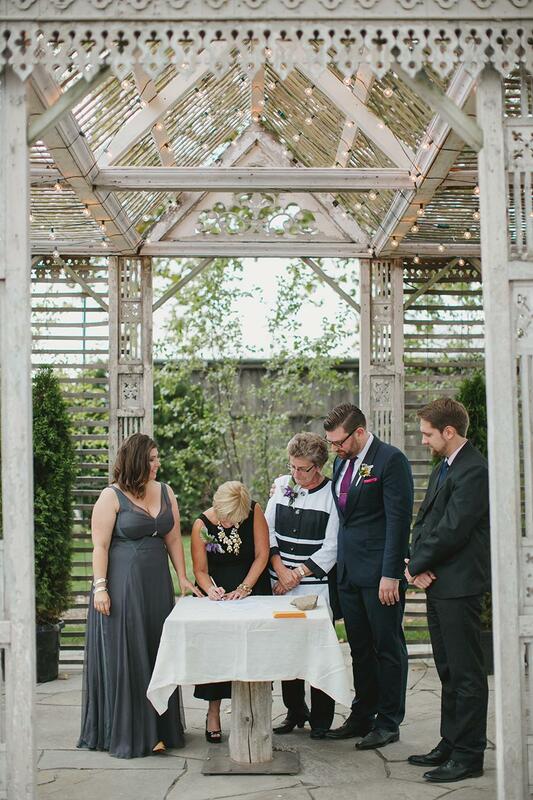 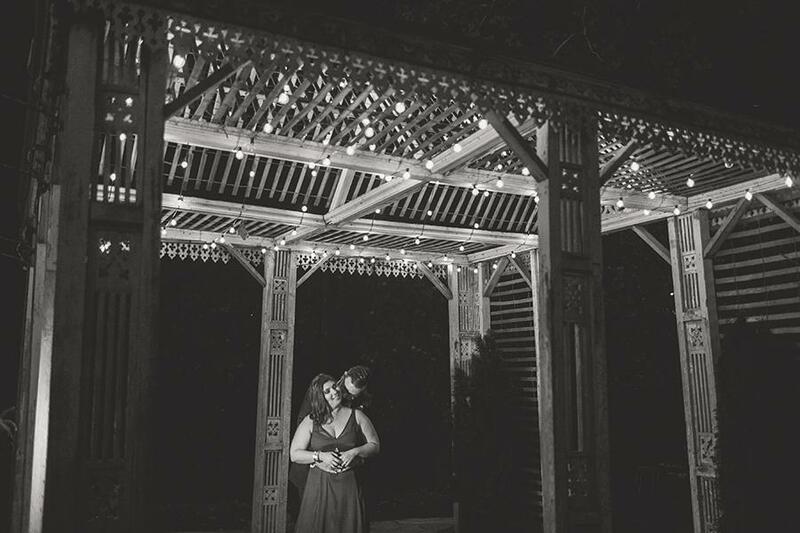 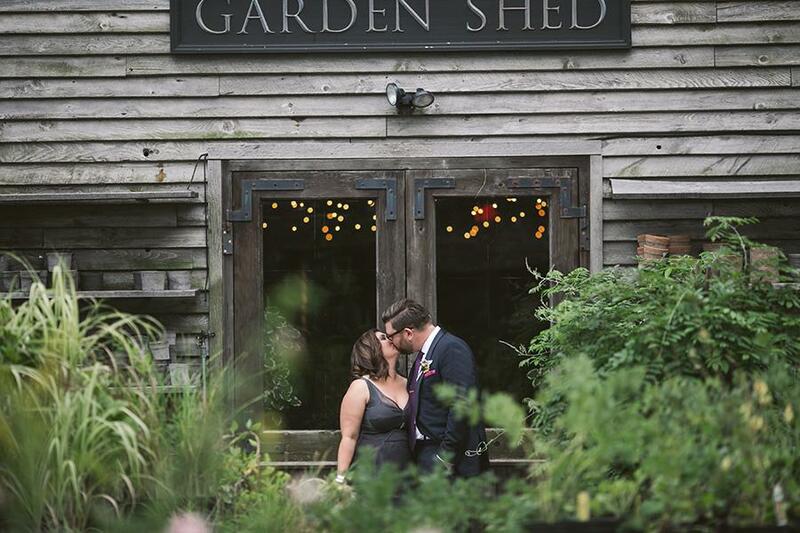 Sarah and Rene wed at the lovely Terrain at Styers venue in Glen Mills, PA. 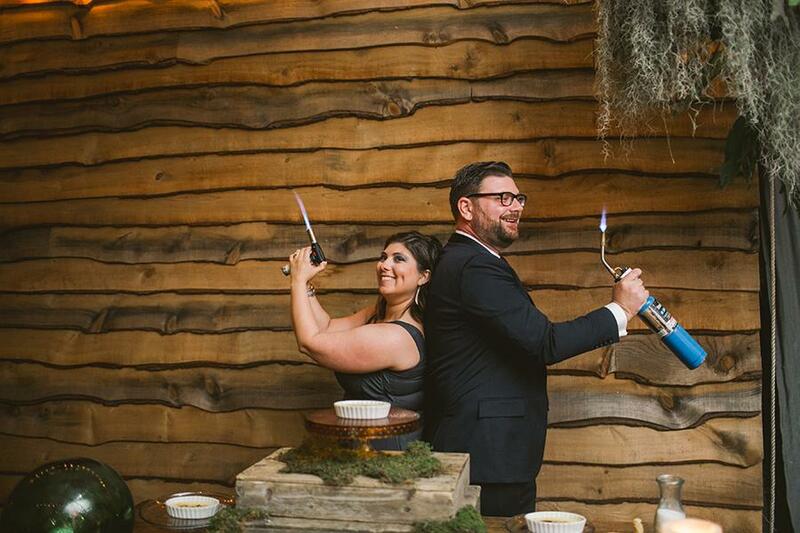 This wedding party seemed to have a good ole time, with a live band, non-stop drinks, and some blow torches were involved, who wouldn’t enjoy themselves? 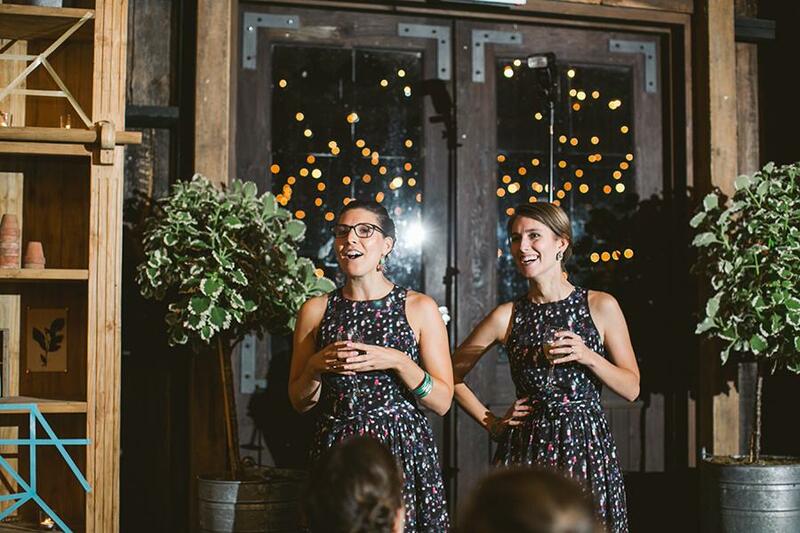 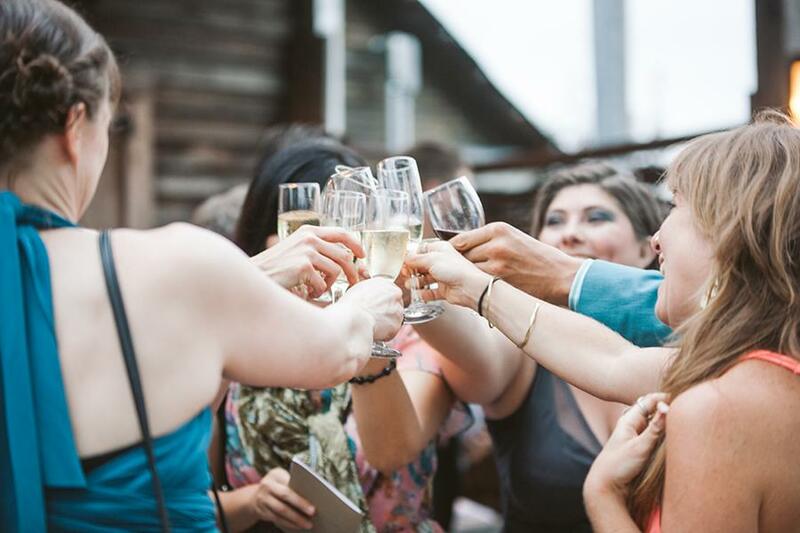 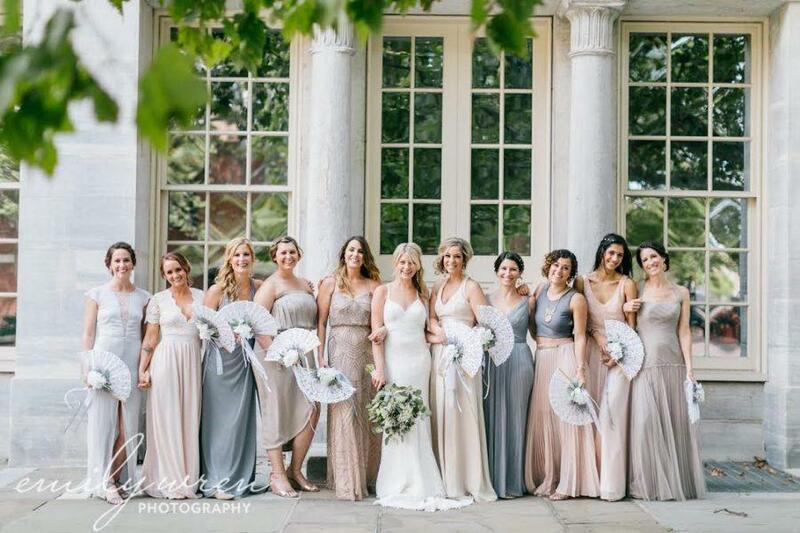 Carina and Tricia at Love Me Do were behind the scenes capturing every single moment of this special day, so keep scrolling to see how it all unfolded! 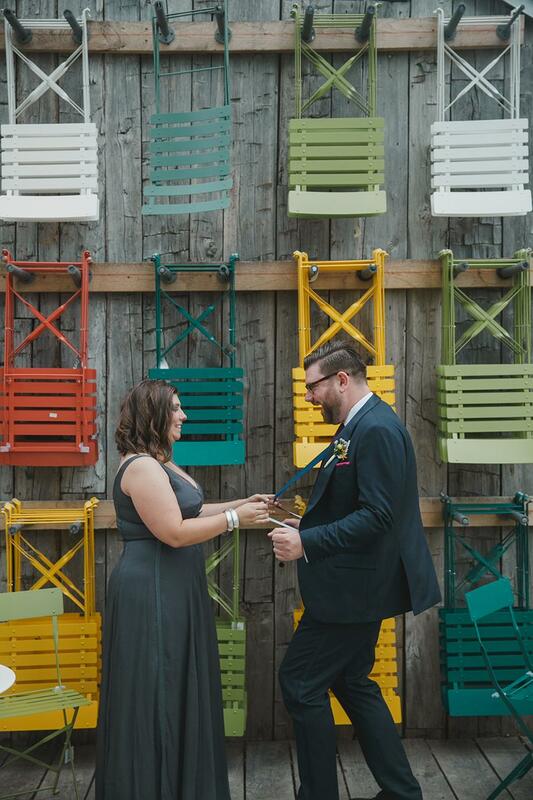 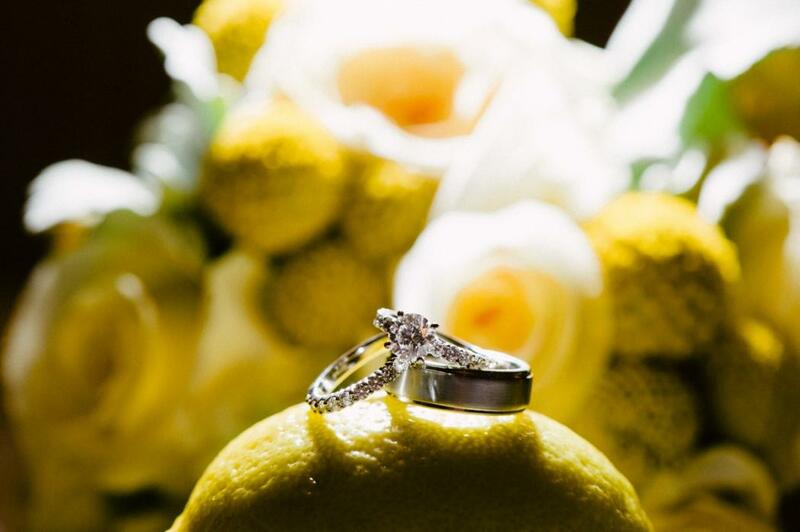 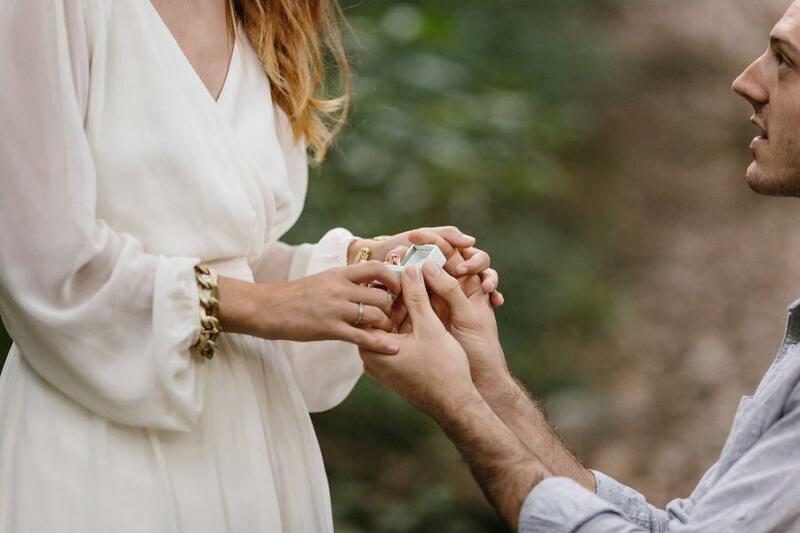 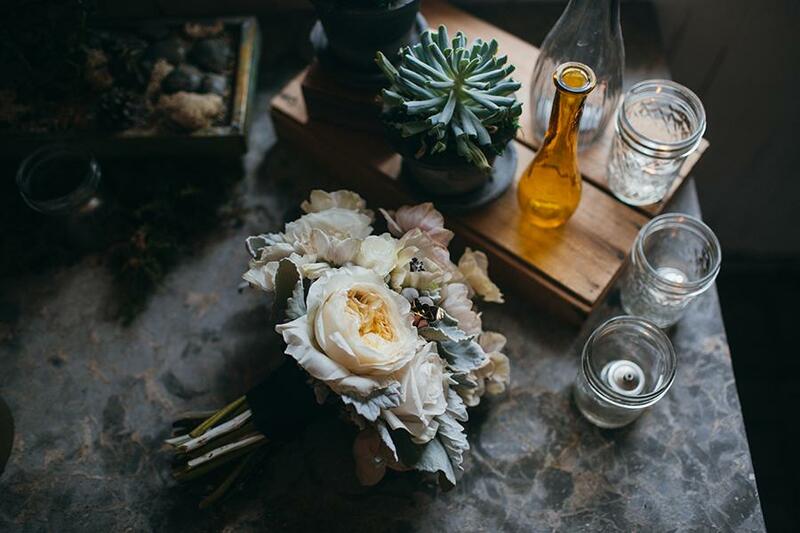 After a couple has shared a life together for over almost 12 years, one of the best places to look for wedding inspiration is in their home. 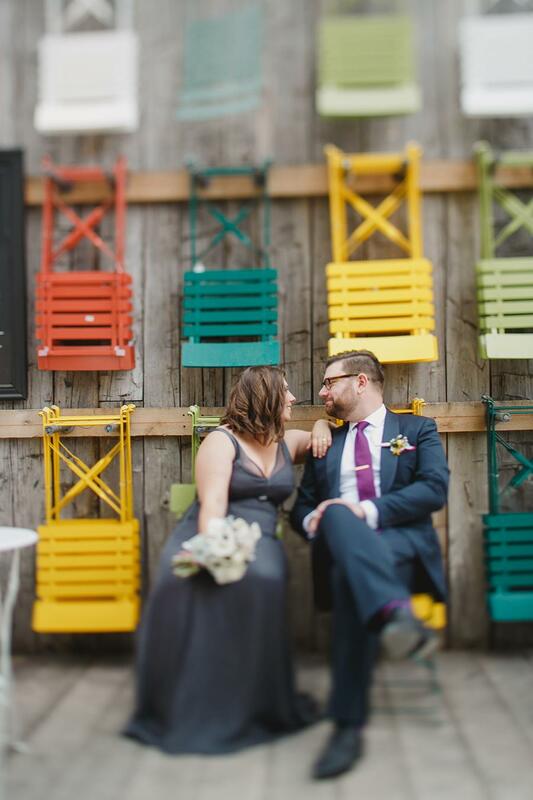 So when Sarah and Rene decided to finally get hitched, they took inspiration from the first work of art they purchased together–a graffiti inspired print by Robert Minverini, a San Francisco based artist and grad of Philadelphia’s own Tyler School of Art. 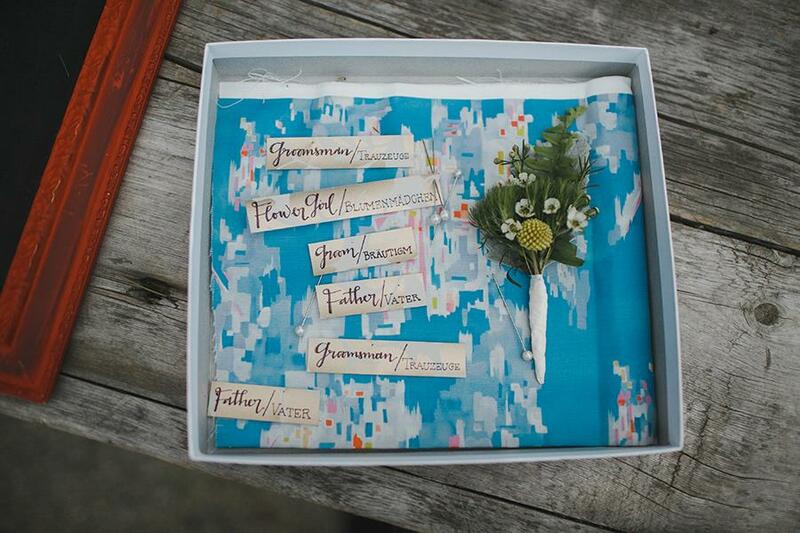 The florals in the print were replicated in the arrangements by Fiori by Stephanie And they sourced a motif matching fabric by Dealtry + Wiksten on Spoonflower.com to make hand-made napkins. 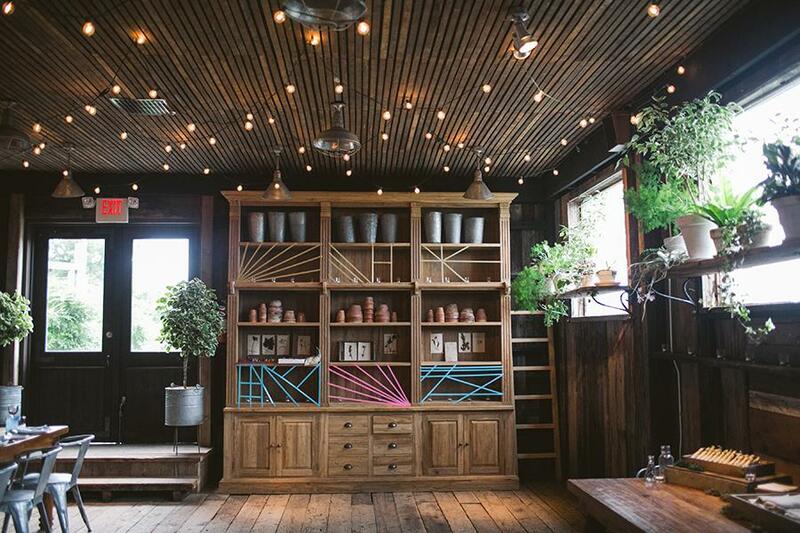 Art also served as a unique decor element. 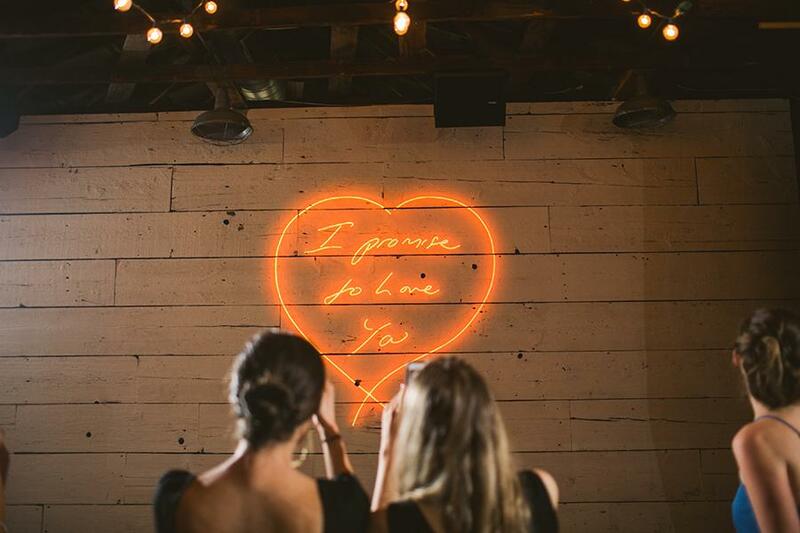 Sarah and Rene projected a small collection of their digital art on a white-washed wall, serving as a great conversation starter and rotating backdrop for the dance floor. 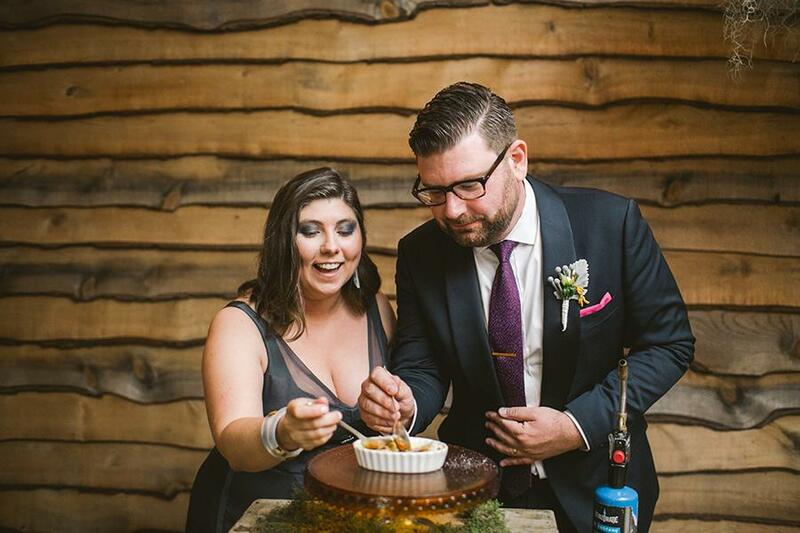 In lieu of cake, Sarah and Rene chose to go with creme brûlée, Rene’s favorite dessert. 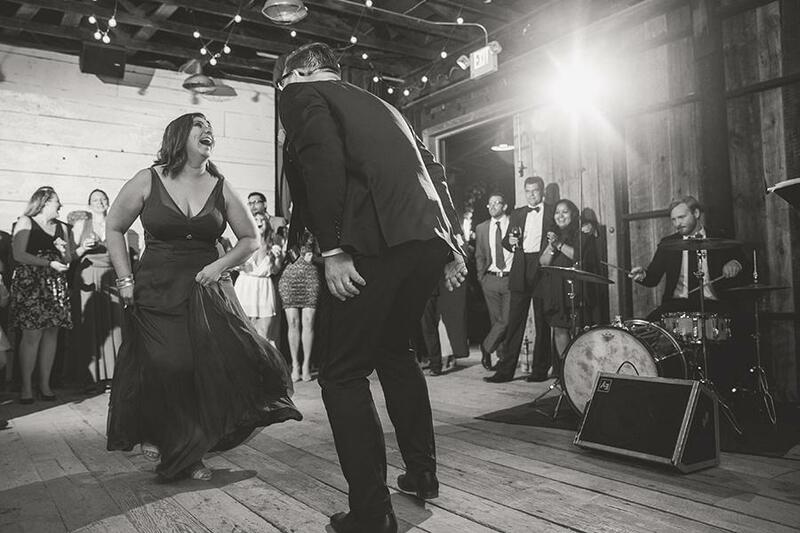 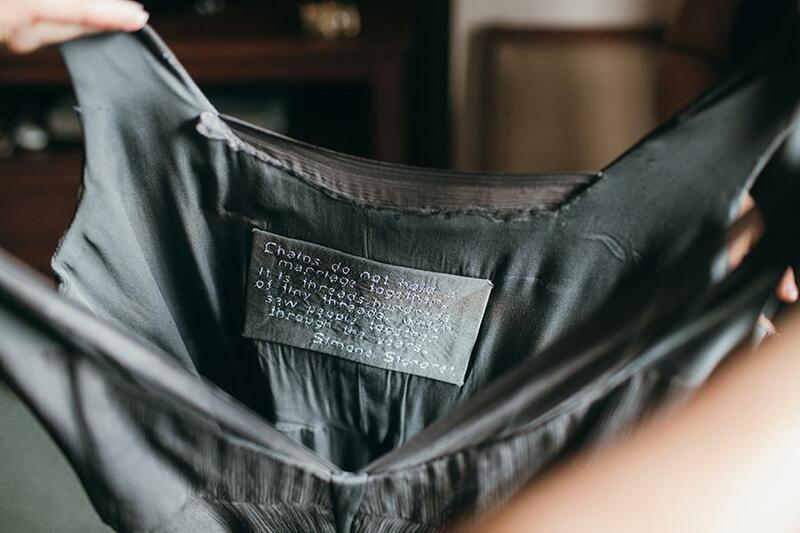 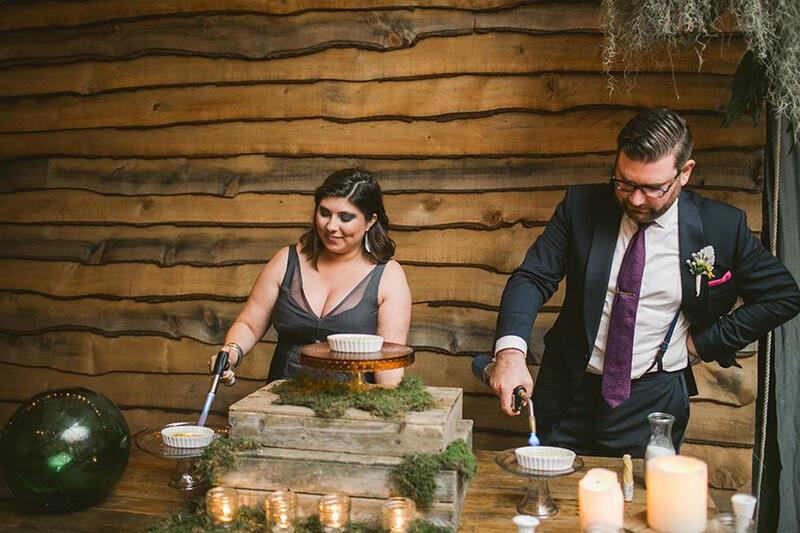 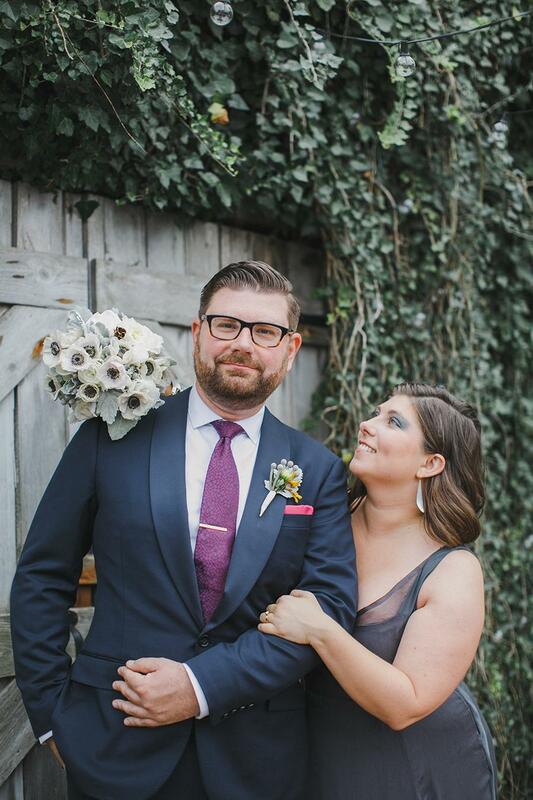 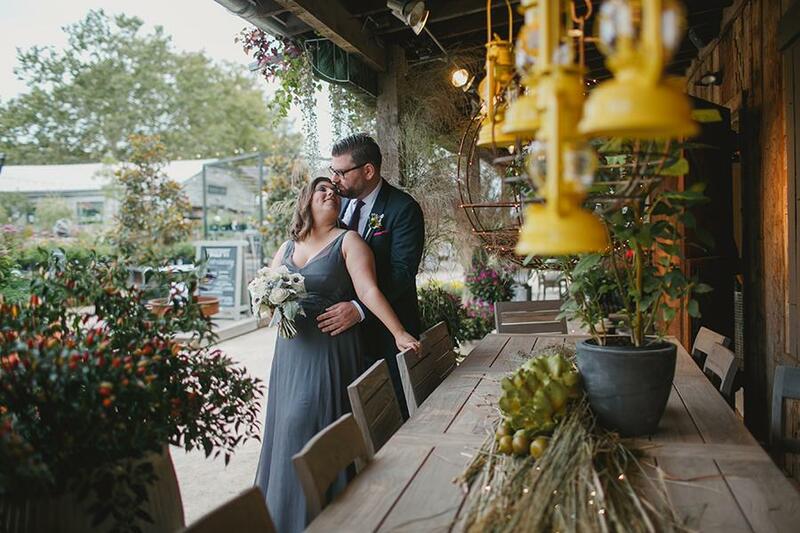 Bespoke elements were also incorporated into the reception–friends and owners of Grand Ten Distillery created a specialty gin cocktail and Sarah’s mother, Sharon, designed and hand sewed a custom gray chiffon dress. 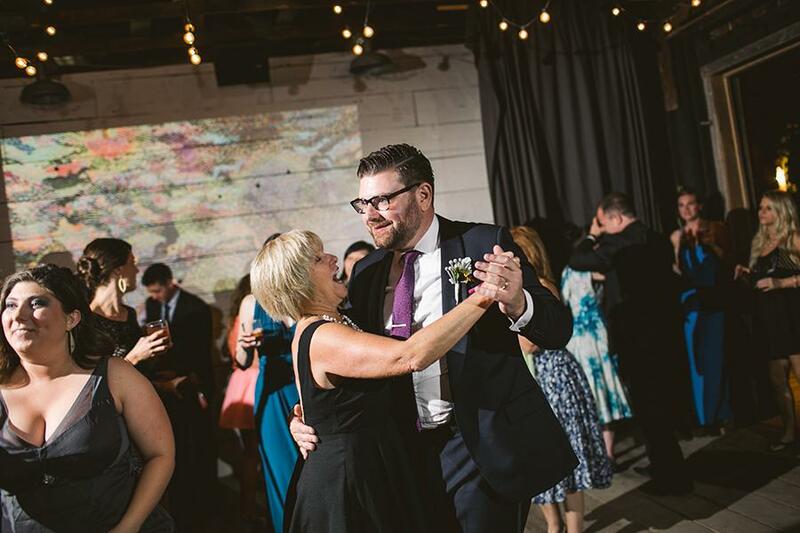 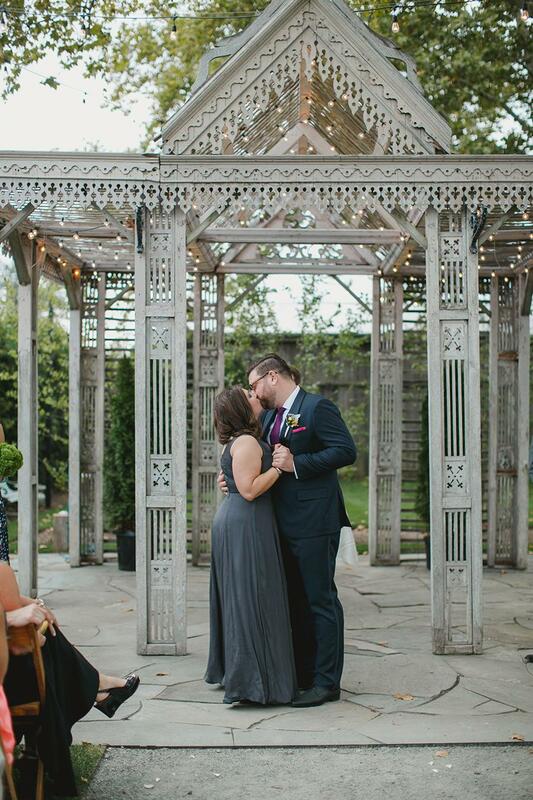 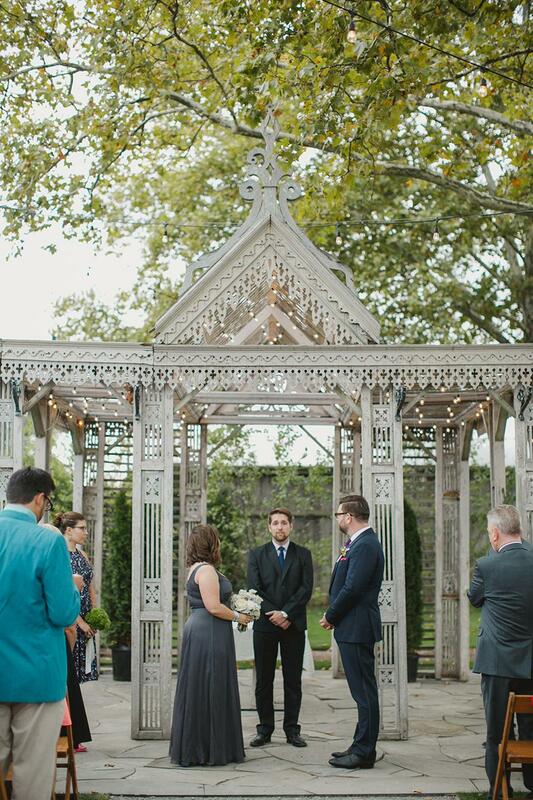 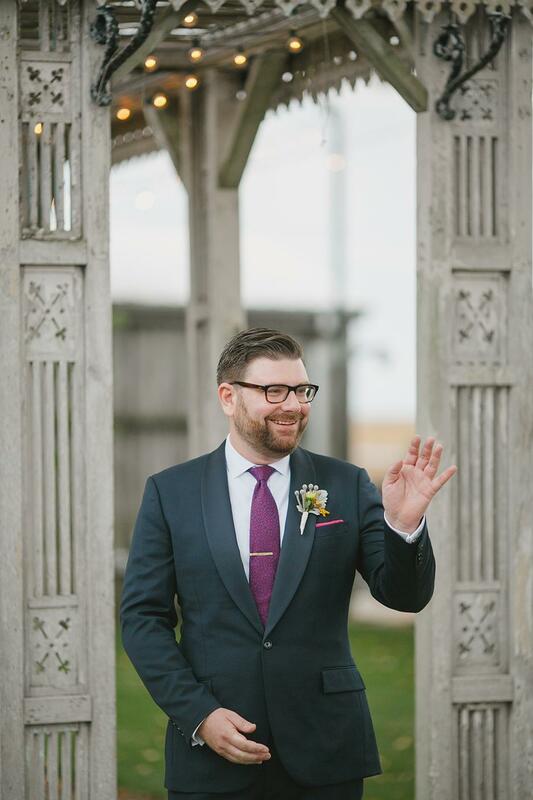 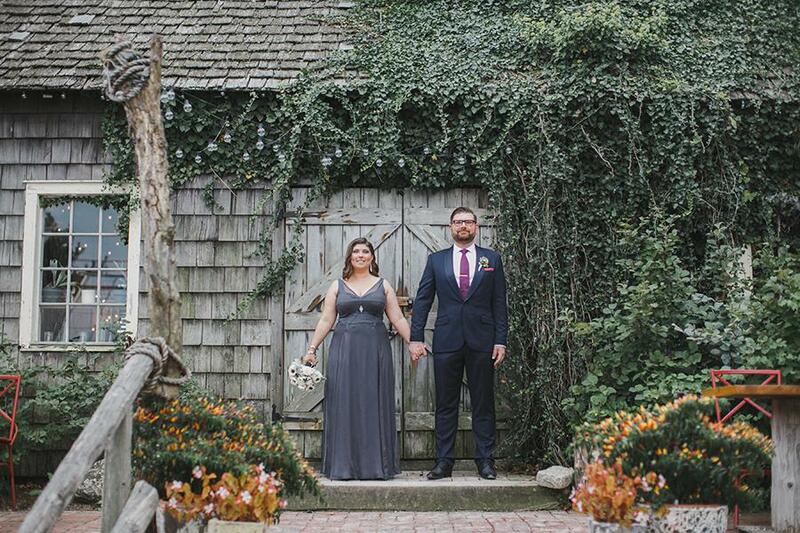 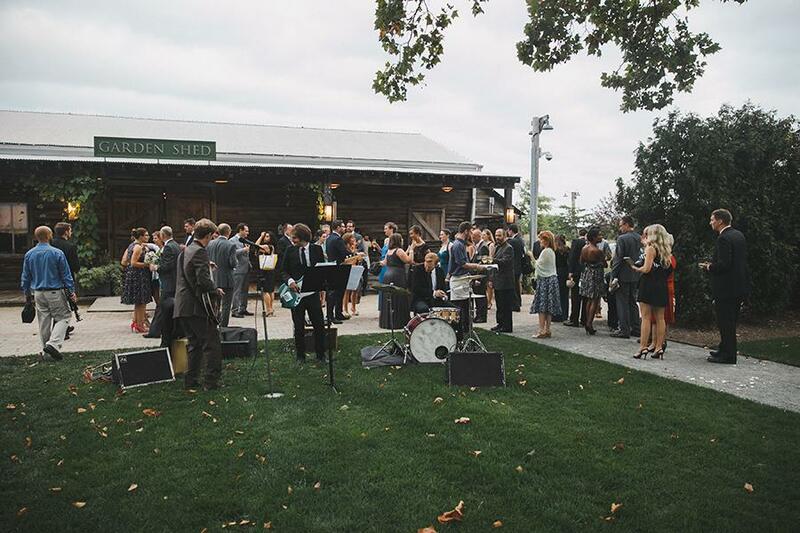 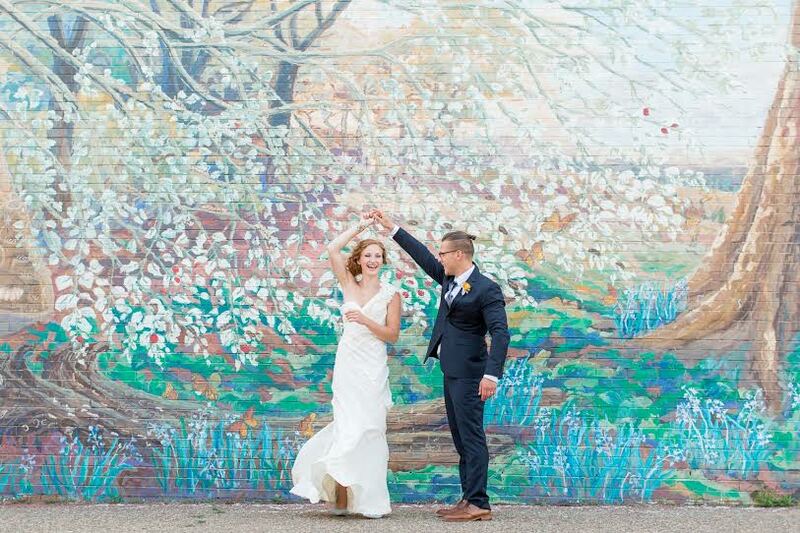 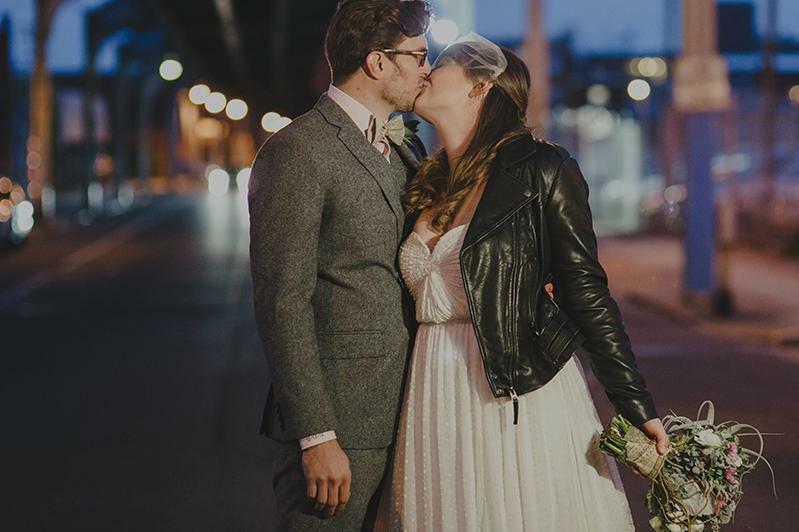 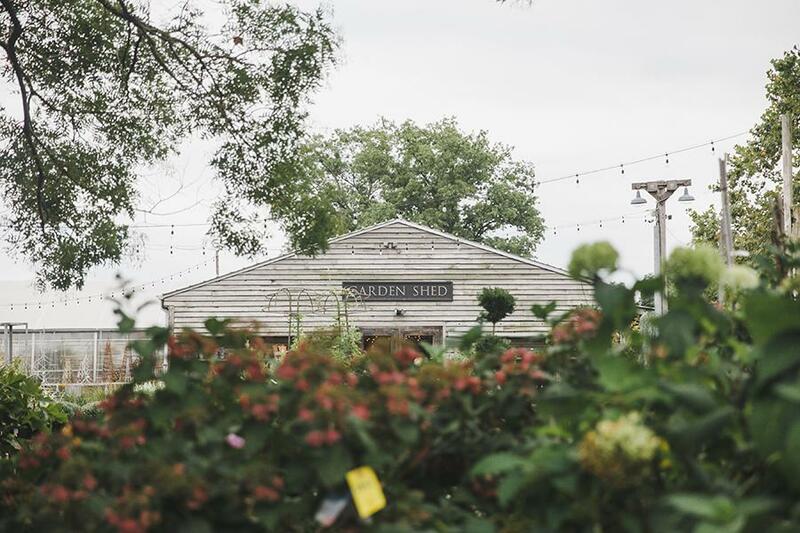 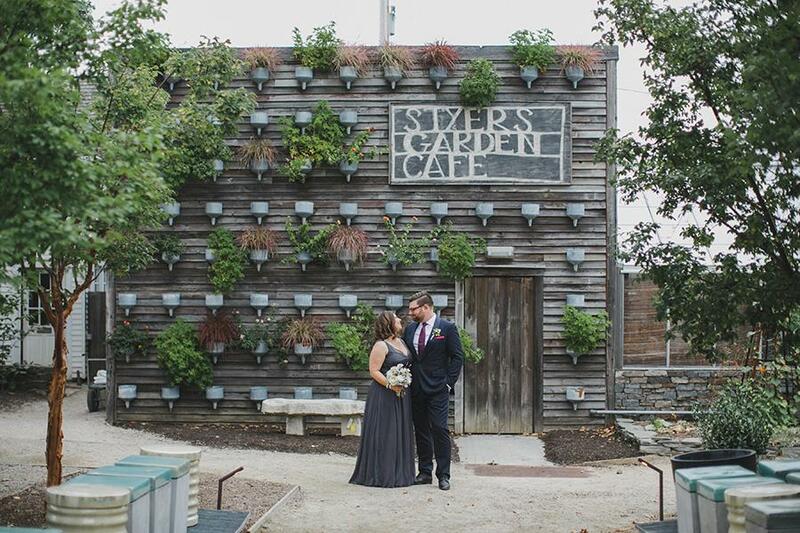 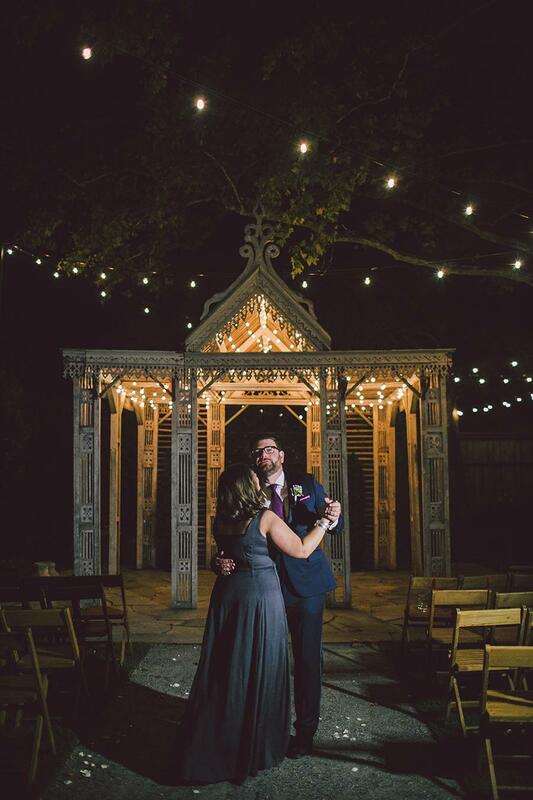 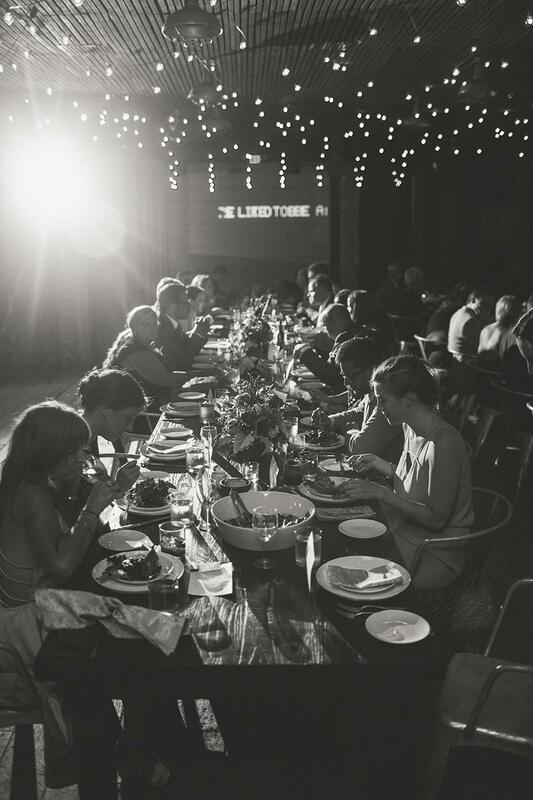 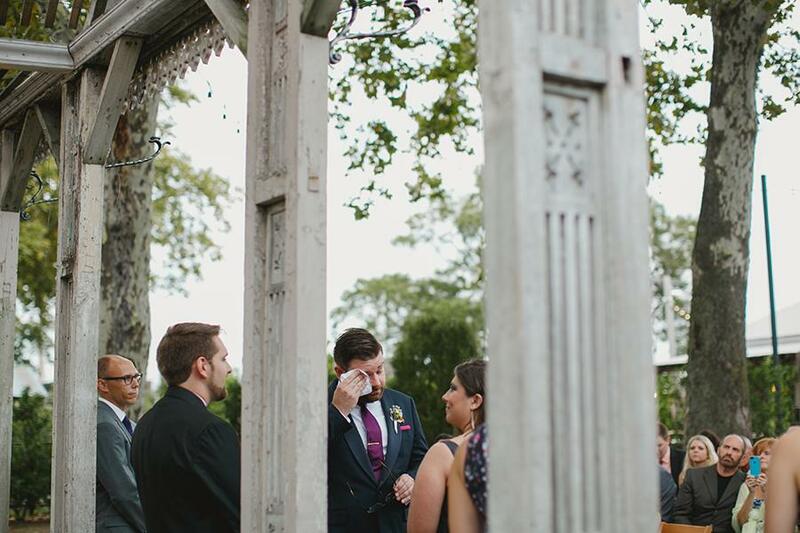 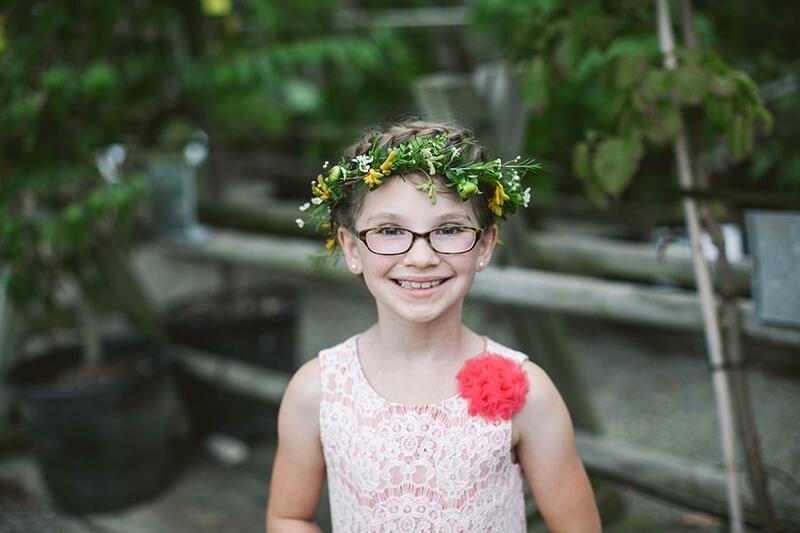 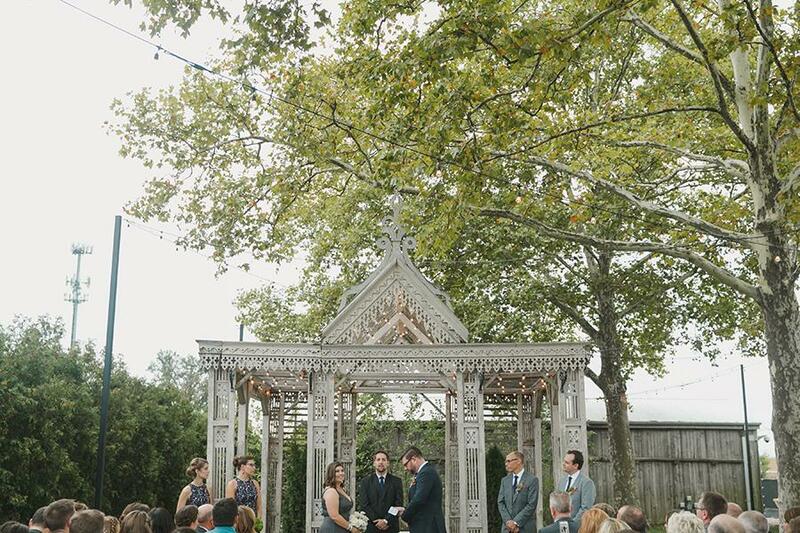 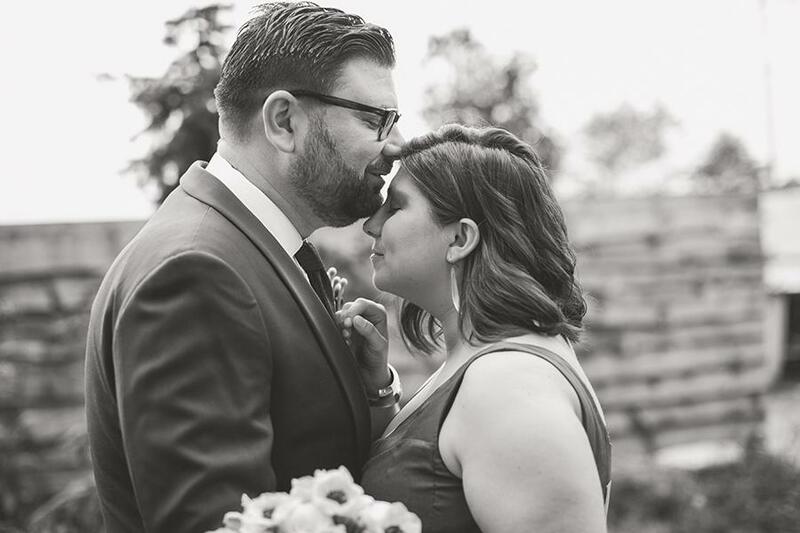 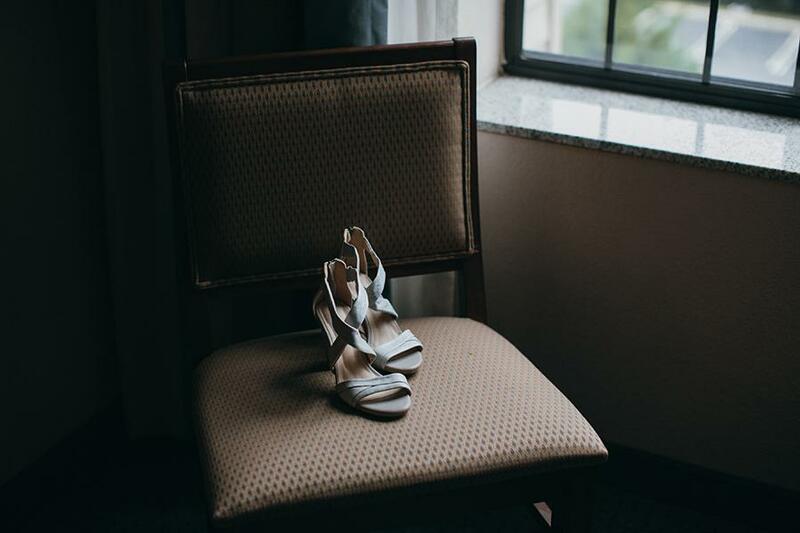 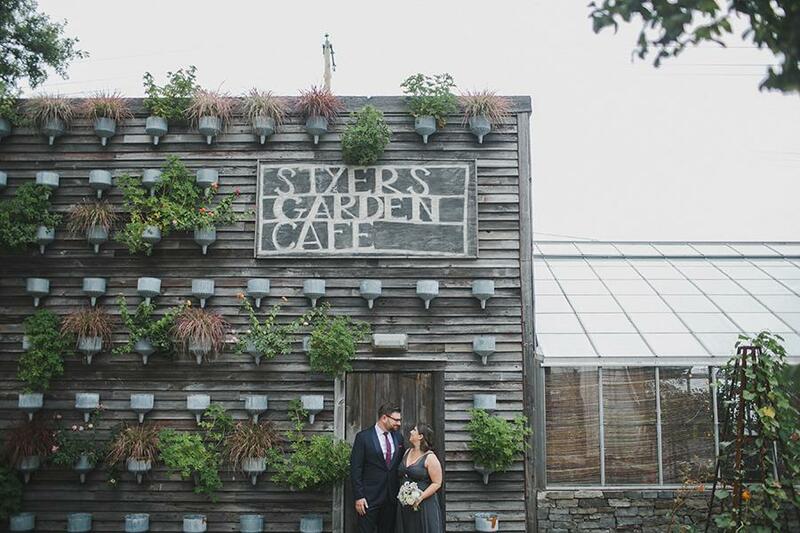 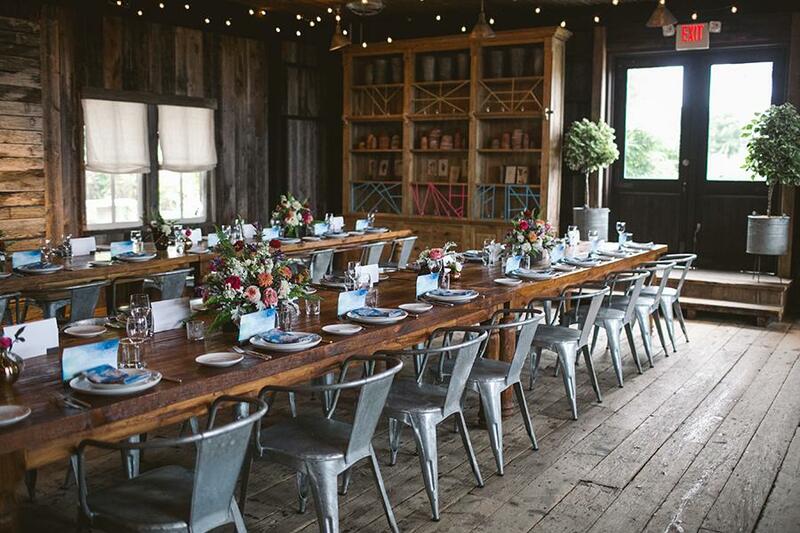 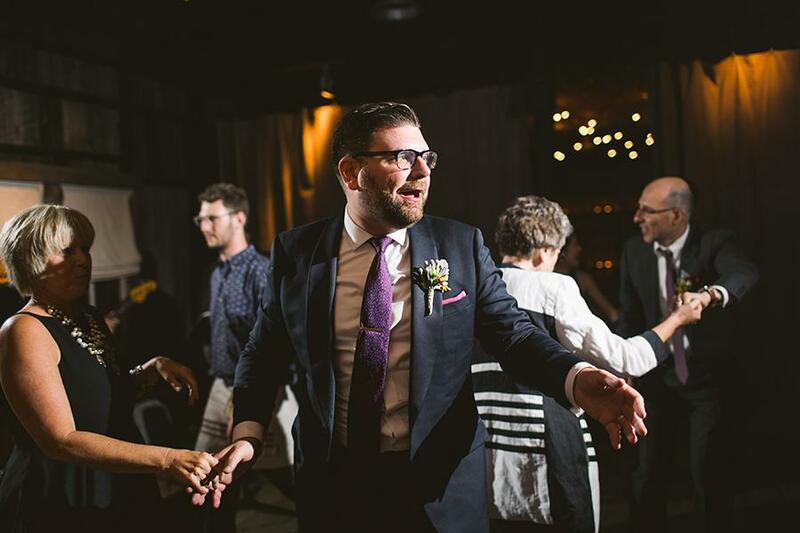 The couple chose Terrain at Styers because the Philadelphia metro area served as the perfect meeting spot for Sarah’s family scattered across Pennsylvania and is an non-stop destination for Rene’s kin based in Germany.